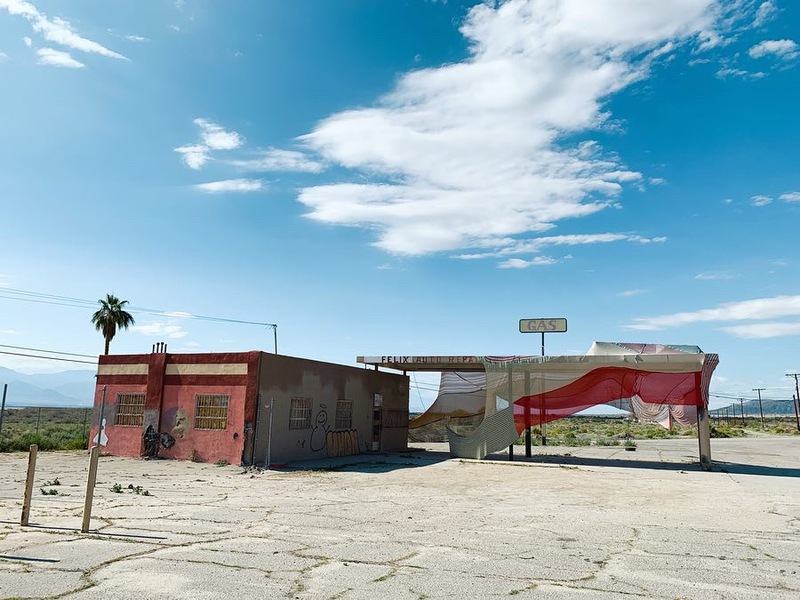 Exhibitions are set up at different locations from North Palm Desert to the Salton Sea, and even one over the border in Mexico. 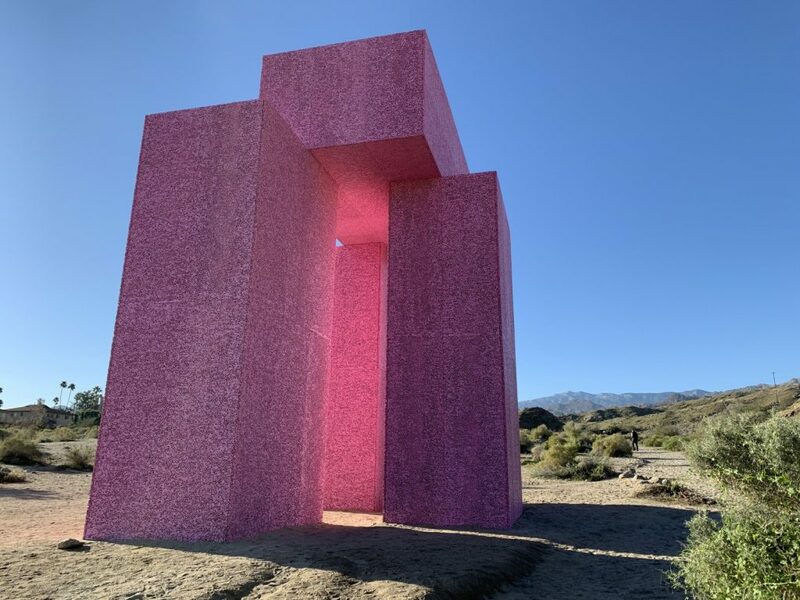 While Desert X has shuttle service for tours of the art installations, for most visitors it’s a choose your own adventure of interesting pit stops. 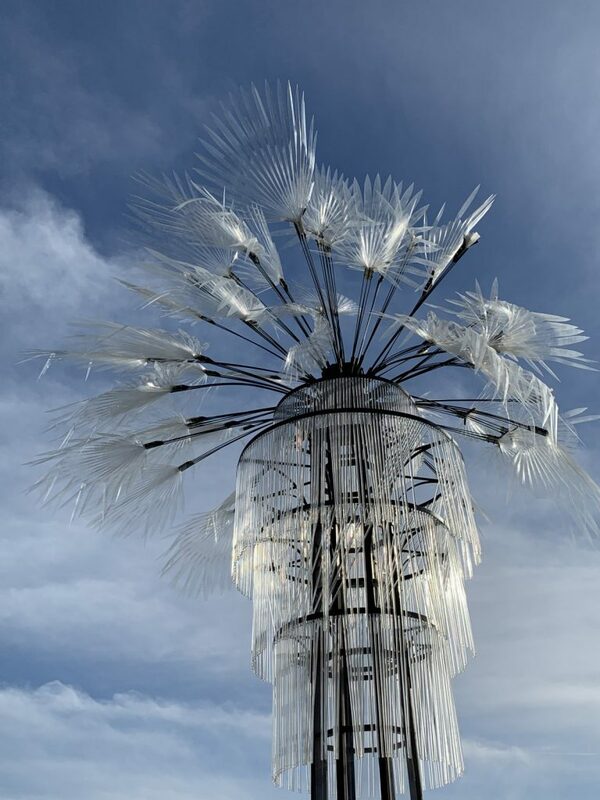 In the Desert Hot Springs area, it’s worth seeing Ghost Palm by Kathleen Ryan and wandering through the Going Nowhere Pavilion #1 by Julian Hoeber. Both these works have graphic lines and hard materials that work well against the desert landscape. 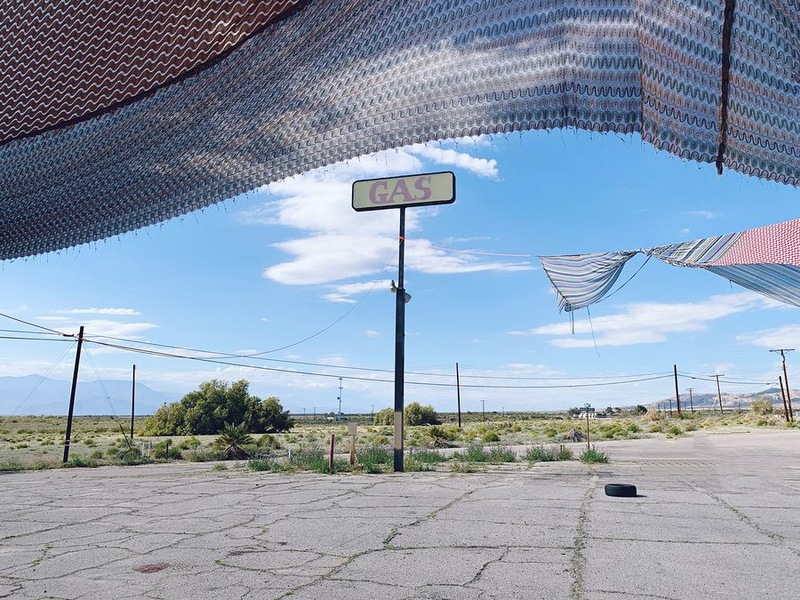 I particularly enjoyed Halter by Eric N. Mack, which is located in Mecca on the Salton Sea. 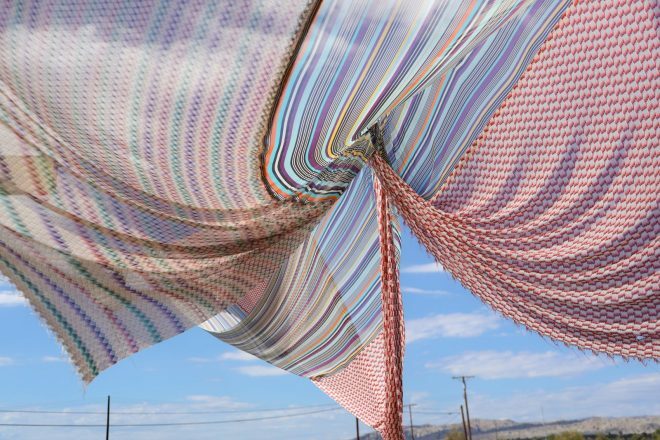 The abandoned building draped in Missoni fabrics is both haunting and charming. 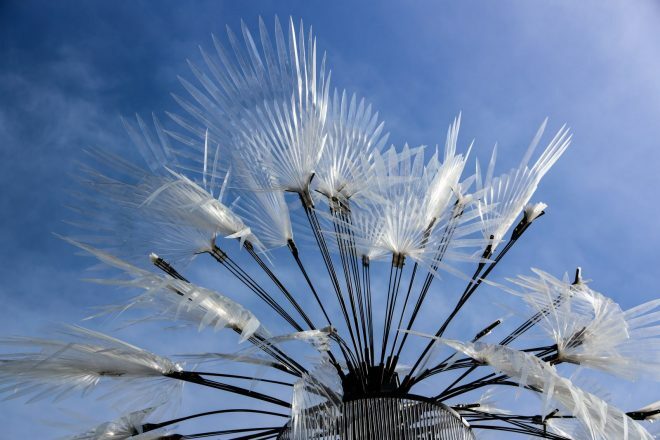 Be sure to wear closed toe shoes if you want to see any of the art installations up close. The desert landscape is rugged. Dive In by Superflex is great all times of the day and night. In the morning it’s Pepto pink walls are pretty and a fun place to stop on a walk through Cap Homme and Ralph Adams Park. Every Saturday from 7-9 pm there are projections on the installation. 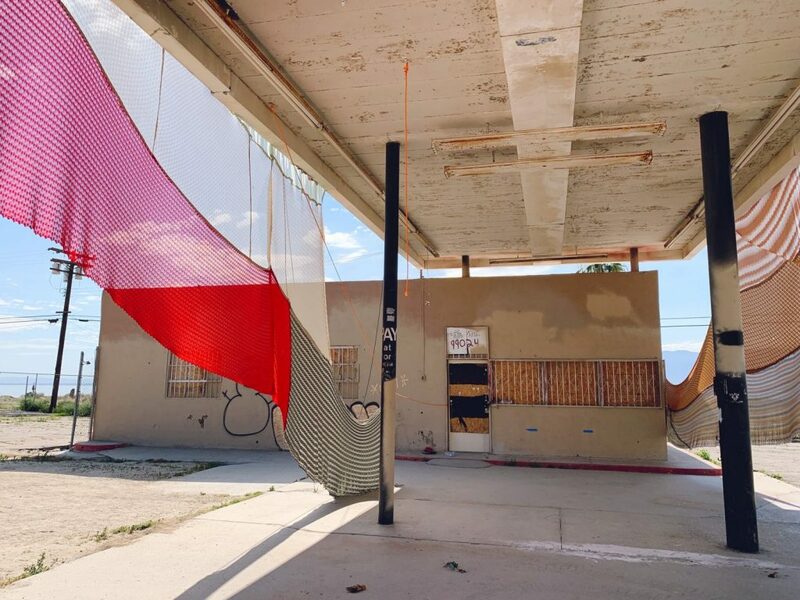 One of the most easily accessible installations is Sterling Ruby’s Specter. Located just off the freeway on Snowcreek Road in Whitewater. 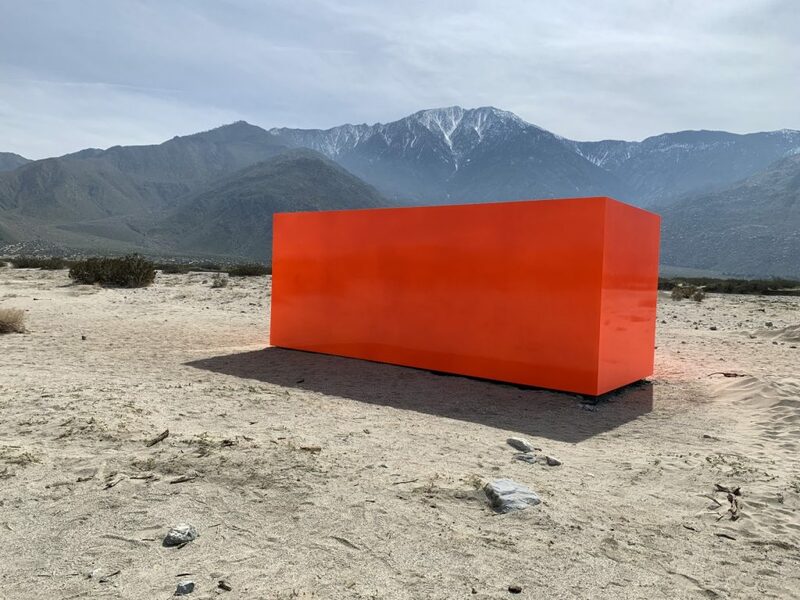 You can see the giant orange monolith from the 111 Freeway. It’s vibrant and surreal. This is an instagram hot spot, so be prepared for crowds or get there early. Some of the works have night time and weekend projections, some are best viewed during daylight hours. 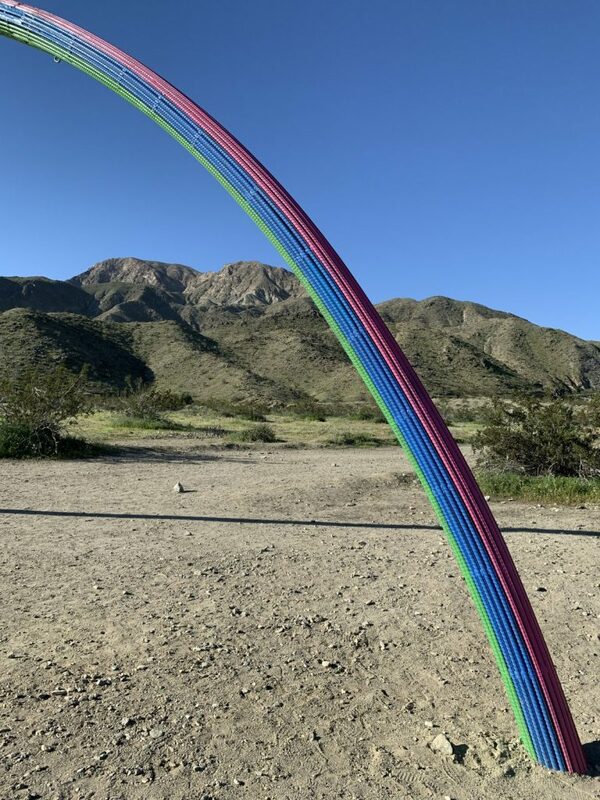 But for anyone looking for things to do in the Palm Springs area, it’s worth checking out at least a few of the installations. 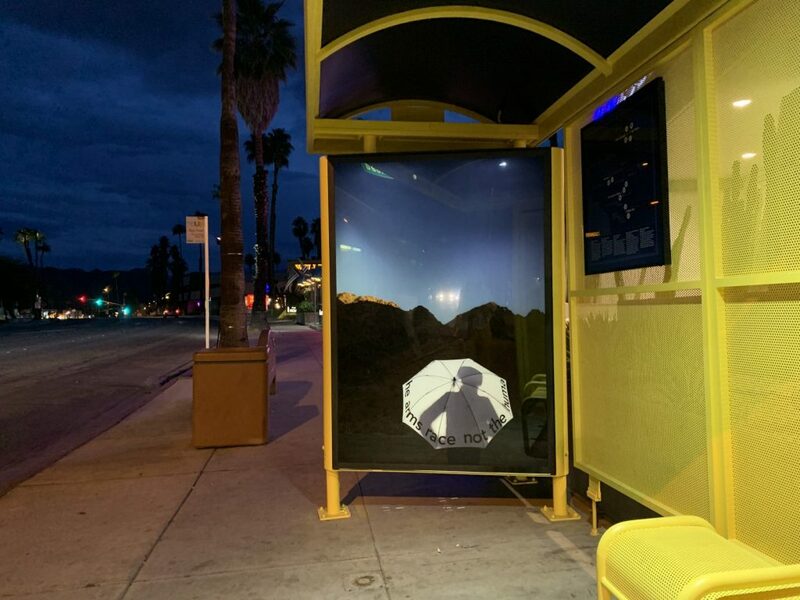 The exhibits in Palm Springs Proper are the easiest to visit and located in everywhere from unoccupied stores, bus shelters and billboards. 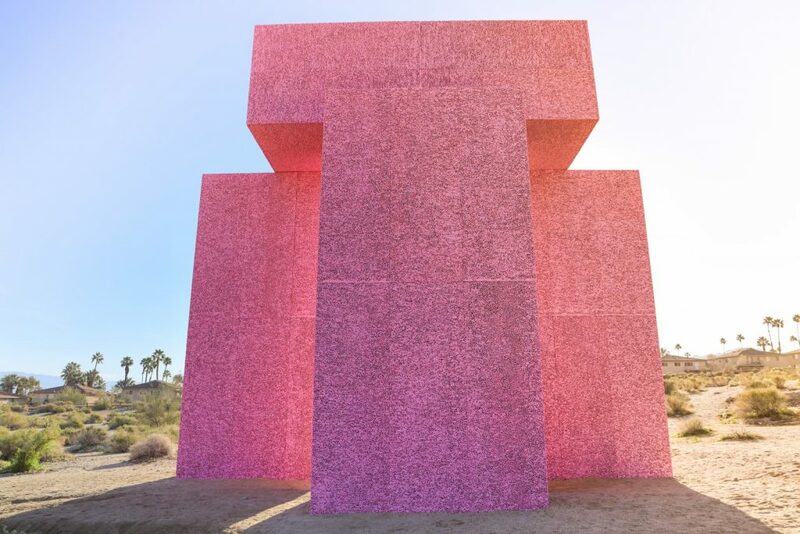 It’s worth downloading the Desert X app and Desert X Map on Google Maps so you can figure out what art is around you. Desert X is free, funky and fun to explore. 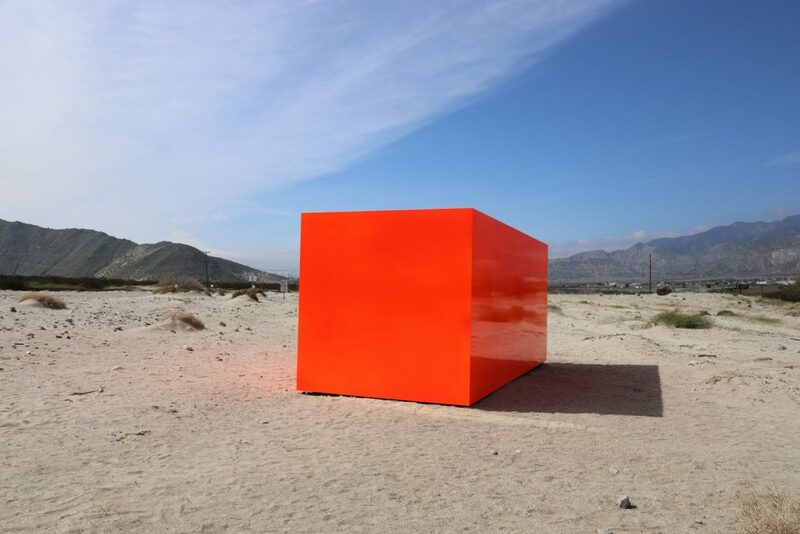 Desert X has hubs in Palm Springs, Palm Desert, and Indio. 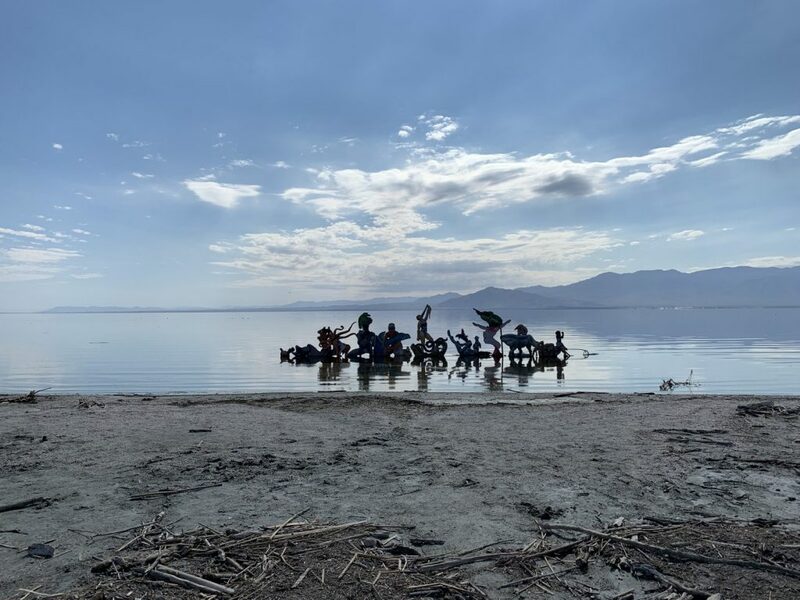 18 artists and collectives have contributed works and installations to the 2019 Desert X biennial event. 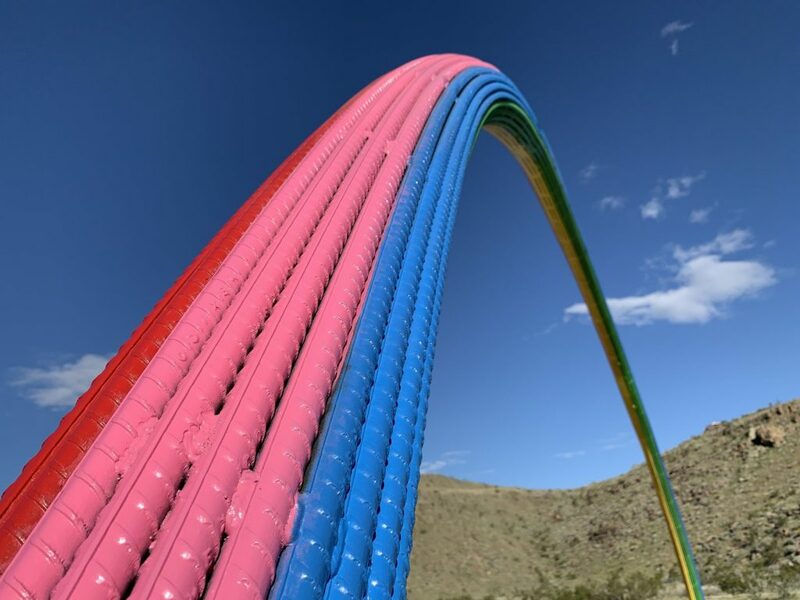 Located in Rancho Mirage, Lover’s Rainbow by Mexican artist Pia Camil is made of colorful re-bar and rock. 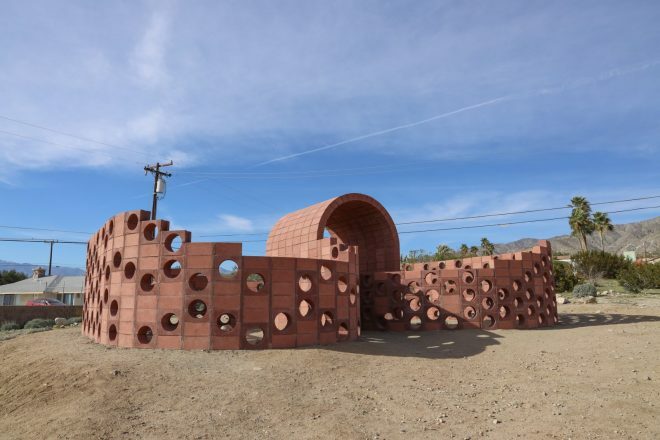 The installation has an exact double located in Ensenada, Mexico. 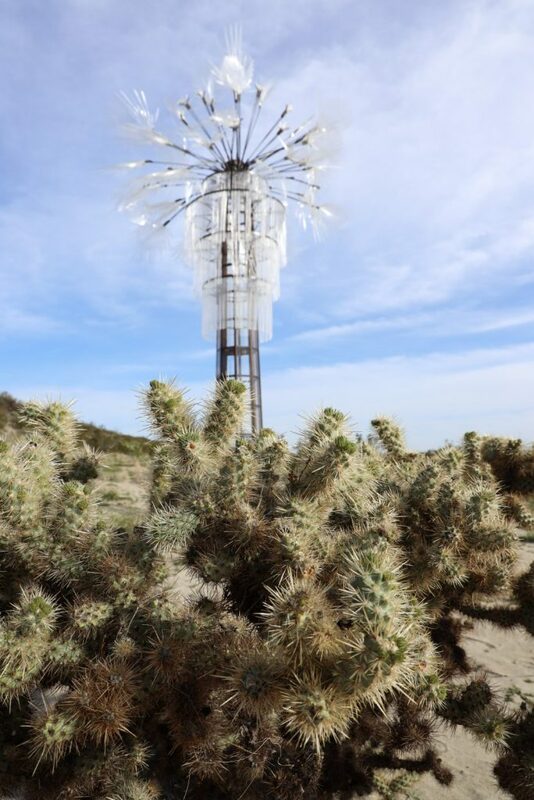 For a $75 fee, Desert X has bus tours on Saturdays and Sundays through April 21st. Private tours can also be arranged. Check out the Desert X website for details. 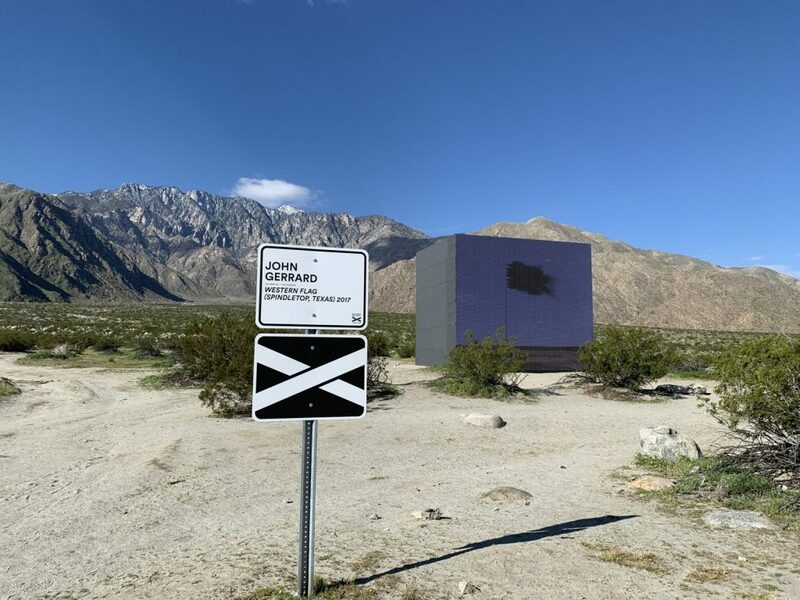 John Gerrard’s Western Flag is one of the easiest works to visit. 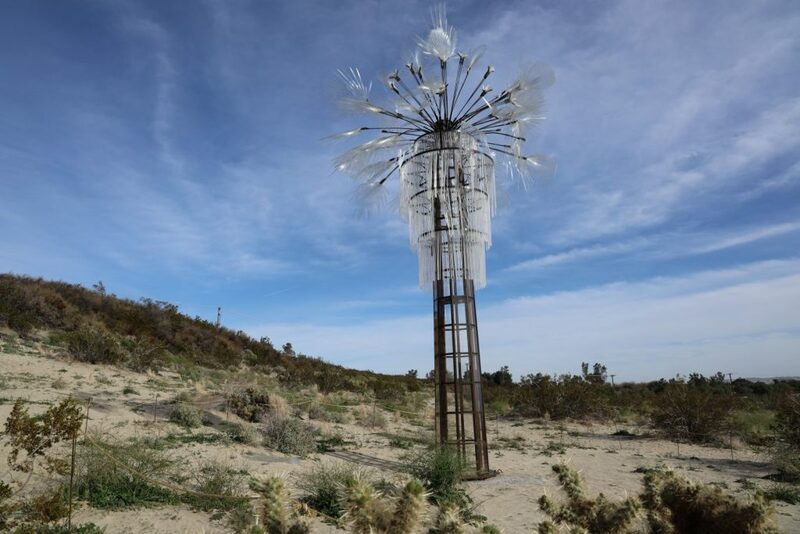 It’s a two minute walk from the Palm Springs Visitor Center on North Palm Canyon Road.